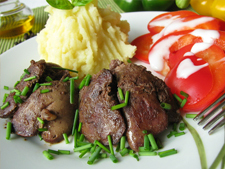 Chicken livers are delicious sautéed and served with mashed potatoes and seasonal vegetables. In a plastic bag; put flour, salt, pepper, paprika and season all (or) poultry seasoning. Add the chicken livers and shake them all about, until coated. Put them into frying pan with butter, onion, garlic and fry for 5 minutes or until brown but still pink in the middle. Serve with mashed potato and seasonal vegetables.